Given the exceptional biological properties attributed to it, royal jelly (RJ) has considerable commercial appeal and is today utilised in many sectors, ranging from the pharmaceutical and food industries to the cosmetic and manufacturing sectors. This has resulted, among other things, in large-scale importation in countries where production is insufficient to meet domestic demand. 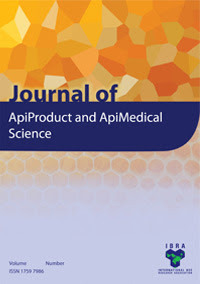 Research capabilities thus need to be reinforced to permit both a reliable qualitative and quantitative evaluation of the different components and the implementation of analytical tests on commercially available products – RJ on its own or as an additive to new or traditional products – also for the purpose of identifying possible adulteration. No official data exist about the RJ market (Grillenzoni, 2002), but China is unanimously acknowledged as being the leading world producer and exporter of RJ, which it sells at highly competitive prices. Chinese production of RJ is estimated as 2000 t/year (a quantity that represents over 60% of production worldwide), almost all of which is exported to Japan, the United States and Europe. Other countries like Korea, Taiwan and Japan are important producers and also exporters. Elsewhere in the world, RJ is produced mainly in Eastern Europe and to a lesser extent in Western Europe and in America: Mexico, in particular, is quite a big producer. Numerous studies have been dedicated to RJ since as far back as the late 19th century (Planta, 1888; Lercker, 2003). However, it is difficult to bring together the data collected by different authors into an organic whole, as the data themselves are not always comparable due to the lack of homogeneity among the materials used, the different sampling procedures and production conditions. Additional complicating factors are the multiplicity of experimental conditions, as well as the diversity of the analytical methods used and their continual evolution. Knowledge of the composition of recently produced RJ is essential in order to define a standard composition, evaluate the quality of commercial products and detect the presence of RJ in other products which containing it. Although the overall analytic data confirm that exposure to a temperature of 4°C causes no alterations in RJ composition, recently it was also shown that only storage of RJ in frozen state prevents decomposition of biologically active RJ proteins and thus RJ should be frozen as soon as it is harvested (Li et al., 2007). The next steps should be: 1. Validate the respective methods of analysis 2. Use the method and create a royal jelly standard, based measurements on royal jelly samples produced in different countries. To this end, the UNI (Italian certification body) is presently drawing up standards for these methods based on the available know-how.